There is little doubt that progressive tech products make our lives better. Crowd-funding platforms help raise money for numerous social initiatives (even for presidential campaigns in the US), automated systems allow harvesting of more agricultural goods and remote work platforms create new employment opportunities. There are hundreds of examples like this as the Fourth Industrial Revolution unfolds. Of course these tech products cannot be built without software engineers and there is an apparent shortage of them in the developed world. They are the fuel of the revolution. For example, according to one survey , 59% of CIOs claim that the tech skills shortage is getting worse. This is where Central and Eastern Europe (CEE) steps into the game. Rich and abundant in tech talent it has already established its brand as a reliable and competent low cost development centre. Cheap talent and cost reduction used to be considered the primary drivers of outsourcing. However, the situation has changed in recent years years. Many CEE firms have grown into solid centres of competence, equal tech partners and value-added developers. There has been a shift in the motives behind outsourcing from labour price arbitrage to expanding the talent pool . That reasonably leads to the question - is CEE tired of low cost outsourcing? In short, the answer would be no. The experience of working with the network of top software development companies in CEE reveals that they still value business opportunities from low cost outsourcing and treat it is as a great revenue stream. However, their ambitions and aspirations have grown together with their competency and contributions to the development of many tech products around the globe. Many CEE development firms have grown and primitive tasks do not interest them as much as before. They want to be equal partners, solve complex problems and express themselves. We call it outsharing. Outsharing - as opposed to outsourcing - refers to having an equal remote partner and building the product together. Outsharing tech partners focus on understanding complex (business) logic and reading between the lines. As opposed to blindly programming, they challenge executives for the product roadmap and propose solutions, driving the biggest value bearing the limited resources in mind. They can be treated as the remote CTO. Outsharing partners align with the company’s culture, engage in frequent communication and adjust to the managerial practices needed. To achieve this in reality, many team members temporary relocate to the partner’s site. Outsharing is based on trust and transparency. In the real world these values are reflected by delegation, engagement and result orientation. While outsourcing is often carried out using a top down approach, direct orders and strict control, outsharing is driven by sharing the vision and goals as well as delegating some freedom for the partner to come up with the best strategies for success. Outsharing partners should have a solid command in communication and articulating the complex tech language into simple words. In many cases they are involved in the strategic decision making process. Finally, their performance is evaluated by measuring results and added value. Strict control is not aligned with the outsharing approach. 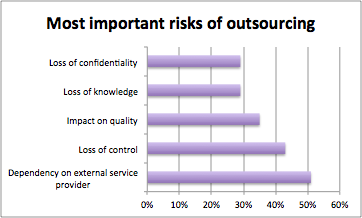 Outsharing addresses the major risks of outsourcing. Quality is the major focus of the value-added development. Outsharing partners do not need to be controlled as they’re intrinsically motivated. Transparency, constant communication and temporary relocation strengthen the knowledge transfer. Of course the issues presented in the figure above cannot be removed completely. For example, the dependency on an external provider still exists, yet the same type of relationship might be witnessed while talking about local partnerships. Outsharing partner is the same CTO with all the risks of dependencies. The only difference is that it’s remote. CEE companies are already playing an important role in innovation and the practice of outsharing . It has already been powering the digital revolution. There are numerous interesting cases worth closer attention. For example, have you heard that part of the software used to design complex NASA operations, US Navy submarines and satellites was actually written in CEE? CEE developers have written the code for the global flight search engine Kayak . They have developed one of the biggest peer-to-peer lending marketplaces in the world. Engineers from this region stand behind the code of the most popular Bible app in the Appstore. They have developed software used by 25% of the world’s heavyweight vessels in the ro-ro category. Bearing this theme in mind, let’s not ask where one of the biggest aviation parts marketplace was built. There are dozens of instruments used by leading world financial institutions, starting from market intelligence tools , continuing by data visualization and finishing-up with Portfolio ROI optimization Systems (undisclosed due to NDA). The number of cases is pretty impressive. The outsharing powerhouse is being successfully explored by some well known corporations establishing their IT departments within the region. HP is present in Bulgaria, NASDAQ is powered by Lithuanian devs while IBM has its innovation centre in Poland. International tech consulting players like Accenture, Capgemini or Epam use the CEE tech talent pool to strengthen development teams. Finally, talents from this region relocate and occupy engineering positions at tech companies like Google, Facebook or recognized organizations like CERN. To sum up, CEE tech organizations still value low cost outsourcing, yet their aspirations and capabilities are way higher. They strive to be equal partners, solve complex problems and build interesting products. Outsharing is the right approach to successfully work with remote partners and it allows us to dramatically extend the talent pool for writing value driven software. Software which drives the Fourth Industrial Revolution. Software which heals the world. So, whenever you hear CEE from a tech perspective, think wider, think tech, think outsharing.